An August 2008 episode of AMC’s popular TV series Mad Men shares more than just a title — “The Benefactor” — with a 1962 episode of the seminal legal drama The Defenders. In the Mad Men episode, the Sterling Cooper ad agency attempts to interest one of its clients (a lipstick company) in to purchasing time on that very same CBS series when the show’s regular sponsors desert the program over the subject matter of the titular episode: an accused abortionist on trial for performing the procedure on a young woman who’s been raped. “Benefactor” marked a turning point in the direction of The Defenders in its first season which, despite its later reputation for tackling tough social issues, spent its freshman year mired in, according to TV historian Stephen Bowie, “silly melodrama or Perry Mason-style courtroom theatrics.” For the rest of The Defenders' four-year run (the show ended in 1965), the program fearlessly dealt with such hot-button and taboo-to-TV issues as capital punishment, the blacklist, child abuse, euthanasia, birth control and atheism, to name but a few. Mad Men's producers may have whetted modern-day audiences’ appetites to get a gander at the inspiration for their homage to the program praised by The Museum of Broadcast Communications as “the most socially conscious series the medium has ever seen “…but if you’re looking to purchase or rent the show on home video you’re going to be sorely disappointed — and an online DVD search will more than likely result in the recently canceled Jim Belushi-Jerry O’Connell series that’s similar to the landmark 1960s program in name only. The last time The Defenders was seen on TV was in 1980 on a lesser-known (and now defunct) cable channel and according to Bowie: “It’s hard to think of another series made after 1960, even one in black and white, that ran for as long as The Defenders (four seasons, 132 episodes) and yet hasn’t been syndicated in nearly 30 years. And that’s not even taking into account the show’s acclaim and enormous historical relevance.” So on the occasion of its 50th anniversary of its television premiere, I’d like to pay tribute to a program that deserves to be better-known…and whose absence on home video is a crime that even the show’s stars (E.G. Marshall and Robert Reed) would have difficulty defending. The origins of The Defenders begin with stage, screen and television writer Reginald Rose — we recognize him, of course, as the author of such screenplays as Crime in the Streets and 12 Angry Men as well as co-writing the screen adaptation of Whose Life Is It Anyway? with the play's author Brian Clark, but during television’s Golden Age he was one of the medium’s most respected scribes, with critically lauded teleplays such as Thunder on Sycamore Street and The Incredible World of Horace Ford to his credit. 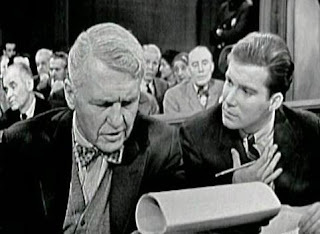 For the dramatic anthology series Studio One (which also presented 12 Angry Men before its silver screen adaptation), Rose penned a two-part episode entitled The Defender, in which the father-and-son legal team of Walter (Ralph Bellamy) and Kenneth Preston (William Shatner) defend Joseph Gordon (Steve McQueen), a young man accused of a crime he swears he didn’t commit. The Defender is the only incarnation of the series to be released to home video (on DVD in 2006); it also bears the distinction of inspiring an episode of Boston Legal (“Son of the Defender”) — in which clips from the live telecast are used to paint the portrait of Shatner’s Denny Crane as a young man. Producer Herbert Brodkin had worked with Rose on both The Defender and previous Studio One presentations, and it was Brodkin who convinced the writer that a viable weekly series could be made from the two-parter, which premiered on CBS in fall 1961. The role of the elder Preston (rechristened “Lawrence”) was recast with actor E.G. 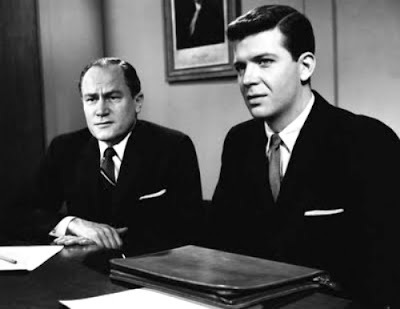 Marshall and Robert Reed played his son Kenneth, a recent law school graduate. The senior Preston was a veteran attorney (more than 20 years before the bar) who acted as mentor to his greener and more idealistic son, though over the course of the show’s four-year run, Kenneth did become a more seasoned practitioner of the law. By that time on The Defenders, however, Ken’s progress as a litigator had taken a back seat to the complicated and controversial legal issues spotlighted in each episode and because this character development eventually was diminished, minor first season players such as the Prestons’ secretary Helen Donaldson (Polly Rowles) and Ken’s girlfriend Joan Miller (Joan Hackett) soon became inconsequential as well. A final speech made by Larry Preston to his son at the end of “Blacklist” neatly provides a summation of the raison d’être for The Defenders: “The law is man-made, and therefore imperfect. We don't always have the answer. There are injustices in the world. And they're not always solved at the last minute by some brilliant point of law at a dramatic moment.” And that’s how the series built its reputation — addressing timely legal issues such as capital punishment, the insanity defense and illegal evidence searches while refusing to do so in a clear-cut, black-and-white manner — and taking judicious time to explore all the perspectives and gray areas present in the process. If you’re shrugging your shoulders in indifference because you’re witnessed this sort of thing on recent shows such as Law and Order and The Practice — where characters employed in the legal profession aren’t there to “win” but simply because it’s their job — this probably all seems tame. However, it’s important to remember that The Defenders not only broke the ground in establishing these now commonplace concepts, but it also ushered in a trend of series that focused on nonviolent “heroes” who usually possessed some sort of professional taint (doctors, teachers, etc.) and confronted important social concerns of the day. Its pedigree of writing and directing talent (Kinoy, David Shaw, Adrian Spies, Alvin Boretz) praised for their triumphs in live television ensured that the 1950s dramatic anthology tradition continued throughout the '60s (as marked by other shows such as Route 66 and Naked City) and though outside location shooting in the Big Apple was minimal, it provided a necessary shot in the arm to the once popular industry practice of producing TV shows in New York. The social relevance of The Defenders also inspired similar series attempting to trod the same ground (East Side/West Side, Slattery’s People) but in terms of critical attention and audience loyalty, The Defenders remained the champ. During its four-year run, The Defenders received 20 Emmy Award nominations and collected 13 of those trophies, including outstanding drama series three years in a row. Among the episodes singled out for Emmy praise (either winning or being nominated): “Madman” (a two-part episode that probes the legal definition of insanity); “Moment of Truth” (son Kenneth is accused of bribing a juror); and “The 700 Year Old Gang” (also a two-parter, and a lighter-than-normal outing about an elderly vintner who’s being prosecuted for bootlegging). But author Stephen Bowie, who has described the series in past writings as “one of my pet TV history causes” draws attention to such integral Defenders outings as “Blood County,” which finds Preston pere and fils defending an accused murderer (a hunter) in an atmosphere of corruption set against a backwoods Pennsylvania burg; “A Man Against Himself,” a script about a black man (Ivan Dixon) who insists on defending himself on manslaughter charges (written by Raphael Hayes, the co-scenarist of the provocative independent film One Potato, Two Potato); and “Kill or Be Killed,” which focuses on the plight of a convicted murderer who killed a guard during his escape from prison, oblivious to the fact that he’s been cleared of the original murder charge. It was Stephen who brought to my attention that despite my previous belief that The Defenders had never been syndicated, the series did turn up in repeats on New York’s WPIX-TV (channel 11) in the late '60s; but its failure to establish itself in more markets could have something to do with the serious tone of the series (it’s probably not the sort of the show you’d program after, say, Gilligan’s Island on a five-days-a-week basis). The Defenders surfaced briefly during the home video era (circa 1980) on the Armed Forces Network and many of the “bootlegs” in circulation were culled from that AFN stint. I wish I could see episodes of this but, as is sadly the case with many films, some even more recent than you'd think, they keep being lost in favor of the new. Remakes of classics combined with constant new technology will make more and more of our past inaccessible to most people because of the greed and short-sightedness of corporations. This is a truly fine article about an incredible TV series of which I have seen only rare pieces. I would have been age 7 to 11 when The Defenders had its TV run, certainly not old enough for its controversial material, although I do remember hearing the theme song after going to bed, knowing my parents watched it often. It is indeed an unjust, money-hungry shame that it is not available to see. I'm astounded at the subjects of the stories for that era of TV. Your article is thoroughly enjoyable in its knowledgable and insightful discussion of the series. Yet besides that, I also feel a real sense of sadness at the state of TV today compared to that time. The sheer talent involved in television at that time is incredible. The plays, writers, actors -- how have we come to where we are now, with The Bachelorette, Bridezilla and cookie-cutter lowest-common-denominator sitcoms? TV today truly is the "vast wasteland" that the man whose name I can't remember foretold it would be. Your article about The Defenders just proves that point. I couldn't help but think about all that as I was reading. It makes sense, therefore, that my favorite part of this post, Ivan, is: "Its pedigree of writing and directing talent (Kinoy, David Shaw, Adrian Spies, Alvin Boretz) praised for their triumphs in live television ensured that the 1950s dramatic anthology tradition continued throughout the'60s." Oh, how we need them now so we could have a new renaissance of great writing and acting on TV. Excellent, thought-provoking post, Ivan. I hope plenty of people see it and feel the way it made me feel. P.S. I forgot something. Mr. Copeland, you have a marvelous site. And you look so much like my favorite cultural philosopher!